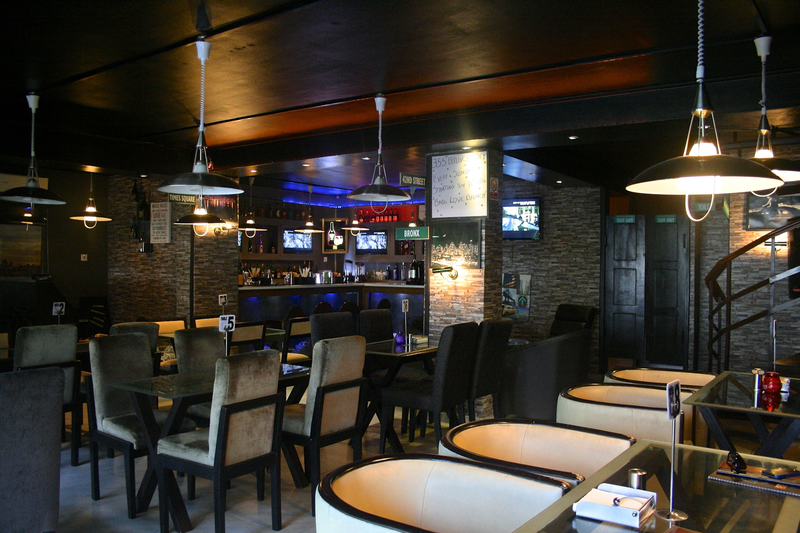 Lagos is full of all sorts of hidden gems and one you might not have noticed is the little bit of New York in the heart of VI that is 355 Lounge. The first thing you notice is the distinctive décor, which lends itself to a whimsical recollection of New York’s more understated landmarks. Homage is paid to Times Square, 42nd Street, Meat Packing District, and 5th Avenue- all set against an impressive backdrop featuring the Brooklyn bridge and a lit up New York skyline. Features designed to evoke a sense of nostalgia in patrons. There are surprising features to this place as well. At the top of a windy set of stairs, sits a cozy lounge bar with a circular ‘pole dancing’ seat in the middle (or maybe it’s a go go dancing stand…). Whatever it is, it achieves a curious result which is not altogether unpleasant. All in all there is a cozy, relaxed feel to 355 that will transport you into a world and a culture far away across the Atlantic to the east coast of America… or not quite. The truth is the décor does evoke New York but it is not designed to transport you there. That would be some feat in the hot, sultry air of Lagos. No it is more designed to illicit memories of when you were there. It draws upon features that are not obvious to the average tourist and so it speaks to the DCB’s (Diaspora come backs) and the IJGBs (I just got backs) who have more than a transient association to these places. The star feature of this venue is unquestionably the bar. Specialising in cocktails, the competent bar staff whip up, shake up and spray up a wide variety of amazingly coloured drinks designed to really get you in that Manhattan party mood. If you need some cushioning for your poison, there is a generous menu of typical New York fare. Burgers, fries and club sandwiches are de rigueur. As are the typical New York appetizers: spring rolls, artichoke dip, nachos and buffalo wings. But where 355 stands out is in the fact that it also serves that ubiquitous American staple – Mexican. Mexican food to Americans is like Indian to the Brits. It’s an indisputable part of a good night out and 355 caters to this particular bit of nostalgia in spades. Fajitas, burritos, enchiladas, tacos and flautas - Ándale!!! The Tostadas are definitely a highlight. Ground beef on a toasted taco shell with cheese, colourful tomato and lettuce with a side of refried beans and Mexican rice and a dollop of sour cream and guacamole. It’s fresh, crisp and light and packed with flavour. The fajitas are also grilled to perfection served with a generous selection of both chicken and steak meat, onions and peppers and all the sides you need to top it off. If you’re feeling less nostalgic and just want to stick to what you know, try the not-so-traditional Spaghetti Arabiatta: a dish with a spicy flavourful twist. The peppered chicken, a Nigerian addition to their varied menu, is also packed with spicy flavours and served with either white rice, fries or mashed potato. Whether it’s breakfast, lunch or dinner, 355 is a great spot to start your night, spend your night or end your night. 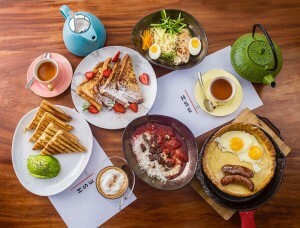 Their all day breakfast menu caters for those early morning or late afternoon cravings. 355 Restaurant and Bar Lagos, in conjunction with Neocove and Daria Diaz from New York City, have curated an exclusive dining and party experience called "Brunxh".Fashioned after the brunch parties of New York and London's trendiest restaurants, Brunxh is a day time gathering set in an environment that breeds social networking amongst eclectic and forward thinking Lagosians. Guests can enjoy delectable eats from a pre-fix menu, unlimited champagne cocktails, and eclectic beats including House, Hip Hop, R&B, EDM, and Afrobeat tracks. The first edition held just this past Sunday was a delight, drawing out some of Lagos' most revered movers and shakers. On Sunday December 7th 2014, they plan to pull out all the stops as they commemorate the one year anniversary of 355 Restaurant and Lounge. It is definitely a lounge- not just a restaurant or a club. It satisfies aspects of a fine eatery with enough of a pre club/ post club vibe. So on your next night out maybe you can tell us what that pole dancing/go go booth is all about.